Wellington Chickering and James R. Lawrence served on the Housatonic. The first Housatonic was launched 20 November 1861 by the Boston Navy yard; sponsored by Miss Jane Coffin Colby and Miss Susan Paters Hudson; and commissioned there 29 August 1862, Commander William Rogers Taylor in command. Housatonic departed Boston 11 September and arrived Charleston 19 September to join the South Atlantic Blockading Squadron. She took station outside the bar. On 29 January 1863 her boats, aided by those of Augusta, Blunt, and America, boarded and refloated iron steamer Princess Royal. 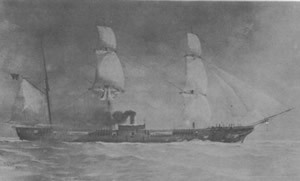 Unadilla had driven the blockade runner ashore as she attempted to slip into Charleston from England with a cargo consisting of two marine engines destined for Confederate ironclads and a large quantity of ordnance and ammunition. These imports were of such great potential value to the South that they have been called "the war's most important single cargo of contraband." It was possibly in the hope of recovering this invaluable prize that Confederate ironclad rams Chicora and Palmetto State slipped out of the main ship channel of Charleston Harbor to attack the Union blockading fleet in the early morning fog 2 days later. They rammed Mercedita forcing her to strike her colors "in a sinking and perfectly defenseless condition" and moved on to cripple Keystone State. Gunfire from the rams also damaged Quaker City and Augusta before the Confederate ships withdrew under fire from Housatonic to the protection of shore batteries. Housatonic captured sloop Neptune 19 April as she attempted to run out of Charleston with a cargo of cotton and turpentine. She was credited with assisting in the capture of steamer Secesh 15 May. Howitzers mounted in Housatonic's boats joined in the attack on Fort Wagner 10 July which began the continuing bombardment of the Southern works at Charleston. In ensuing months her crew repeatedly manned boats which shelled the shoreline, patrolled close ashore gathering valuable information, and landed troops for raids against the outer defenses of Charleston. Meanwhile Housatonic vigilantly maintained her station in the blockade outside the bar until just before 9 o'clock on the night of 17 February 1864. Her officer of the deck sighted an -object in the water 100 yards off, approaching the ship. "It had the appearance of a plank moving in the water," he later reported. Although the chain was slipped, the engine backed, and all hands were called to quarters, it was too late. Within 2 minutes of the first sighting, H. L. Hunley rammend her torpedo into Housatonic's starboard side, forward of the mizzen-mast, in history's first successful submarine attack on a warship. Before the rapidly sinking ship went down, the crew managed to lower two boats which took all the men they could hold; most others saved themselves by climbing into the rigging which remained above water after the stricken ship settled on the bottom. Only two officers and three men in Housatonic were lost. H. L. Hunley, with all her gallant crew, perished in the attack; but only after having written a fateful page in the history of naval warfare which foretold a giant role for undersea warfare in generations to come.